Mayor David Briley laid out several ideas in the works to help ease the traffic problem across Metro Nashville. It's been two and a half months since voters turned down the Let's Move Nashville Transit Plan, which would have cost billions and raised four different taxes to create a dedicated funding source for transportation across the city. The plan involved trains, buses, and transit centers stationed across town. But with Nashville on the rise, the Mayor said the city cannot stand still. He said he frequently hears from outside businesses looking at locations in Nashville that are concerned about local traffic and infrastructure. 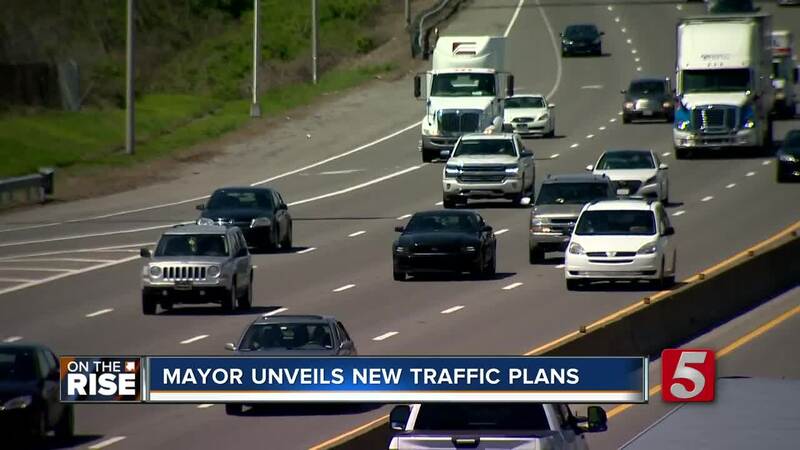 In an exclusive interview, traffic anchor Rebecca Schleicher spoke with Mayor David Briley about different plans to fight the growing traffic problem. He laid out several ideas, including adding technology like sensors and cameras to traffic lights to help ease the flow of traffic around the area. The eventual plan is for an entire traffic control center to serve as a hub for the different intersections across the city. "It's going to be a lot about technology. It's going to be a lot about being smarter," Briley said Wednesday. The mayor also floated the possibility of a bus-only lane on Interstate 24 from Rutherford County, along the area's most problematic corridor. "TDOT and Nashville and Murfreesboro are looking at buses on shoulders, so buses can use the shoulder there," he said. However, TDOT officials warned buses riding on shoulders is not a solution that can work in many places, with shoulders that are too narrow to accommodate traffic blocked by bridges and rock walls on many state roads. Mayor Briley said the city is also working on a plan to get federal dollars to help plan and develop traffic solutions along Dickerson Road, a corridor the city expects to explode in growth in the coming years. "We can invest in better infrastructure at intersections," he said. "We know that we can build out in such a way that transit will work well there [in the future]." The city, one of the area's larger employers, is also taking steps to change schedules, so city employees aren't adding to the congestion at peak hours. "It's hard to have someone from the Parks Dept working from home or from Public Works," Briley said, "but we can have them working earlier or later." Public Works staff are currently preparing a presentation on "choke points" throughout town that need extra technology and attention to keep traffic moving. When the study is complete, they will present their findings to Metro Council, which can act as it sees fit. But there is a catch. Without a funding source, the city said many of its ideas aren't possible. Facing a budget shortfall, that means Metro Nashville will rely heavily on state and federal funding to bring the ideas to life. "We don't have a dedicated revenue source anymore because the referendum did not pass," Briley said. "We have to use our existing revenues, our existing partnership, and try to leverage them as best we can." Voters overwhelmingly said no to the city's proposed transit plan May 1 after years of public input, and city leaders seem to believe the failure of the referendum was less about the plan itself and more about the four taxes that would be raised in order to make it happen. One thing you shouldn't expect on the horizon, according to the Mayor, is another referendum. "I think the people spoke pretty clearly." While there may be a need for it someday, he said that will be in the very distant future.